74’ - DOUBLE SUB CLUB. Aaron Kovar in for Ivanschitz and Friberg comes off for… wait for it… SOUND THE HORN OF ROLDAN. Brad should not be playing defense, please stop. I guess we have no one else. 74’ - DOUBLE SUB CLUB. Aaron Kovar in for Valdez and Friberg comes off for… wait for it… SOUND THE HORN OF ROLDAN. 76’ - Morris is now up top, with Kovar wide right, Dempsey underneath and Ivanschitz marauding like a soccer version of Mad Max. 80’ - Is there another goal buried around here somewhere? The Sounders could use it. 81’ - Kovar and Ozzie both whip in shots that get blocked off. America trying to slow things down a bit. They’ll be fine with 2-2. 82’ - That little shield-and-turn Roldan just did in traffic is so Ozzie. The benefit of playing with really good players, right there. 85’ - Third sub still lingering. I’d probably take off Ivanschitz, throw on Darwin Jones and go for it. 85’ - As I said that, Morris trots off for Darwin Jones. Darwin Jones in for Sounders, and now each side has a player named Darwin on the field. 86’ - Darwin Jones wins a 50/50 and CA gets the call about 25 yards out. Involved already. Can tell you @darwinljones has been on fire in preseason. 87’ - Crazy to think this was Dempsey’s first ever CCL game. HE’S DONE ALRIGHT THAT KID. And just like that, Darwin Quintero is substituted for. Spoilsports. 88’ - America’s FK is dug out nicely by Frei, who deserves better than two GA based on his performance. 89’ - This is where it’s obvious one team hasn’t started its season yet. 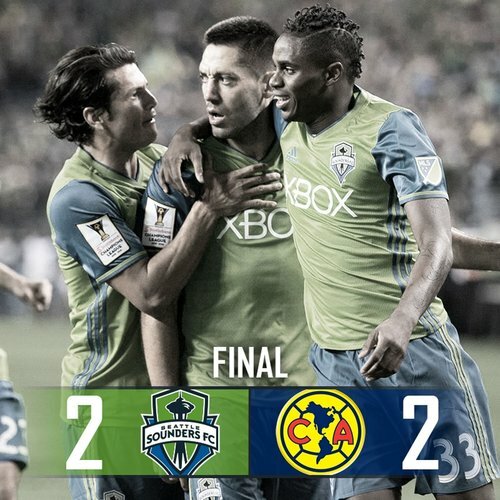 Sounders looking tired. 91’ - Andreas Ivanschitz is A BIT PERTURBED about getting a yellow card. 91’ - Dempsey earned FK jujutsu outside the box. And Clint’s down.